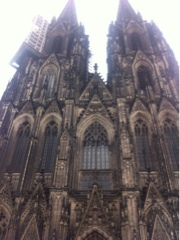 Today was my second day in Cologne. I slept in late and when I woke up, Steffi and her roommate were making an awesome German breakfast. This means there were different kinds of bread, boiled eggs, and toppings. The toppings ranged from cheese to jelly to meats. The idea is to mix and match things with the breads. In the middle of the day, Steffi and I rode the train to visit the cathedral in the city and walk along the river. Afterward, we went in search of hot chocolate and out of nowhere, we bumped into Steffi's parents. What a nice surprise! Steffi grew up here and has never just bumped into them before. This evening, I went to the grocery store to pick up a few items that we don't have in the US. Being a foodie, one of my favorite activities in a foreign country is an extensive grocery store trip. I love to see different fruits, candies, and especially different chip flavors. I'm eating a newly acquired package of Haribo candy as I type this. In preparation for another big day ahead, I'm taking it easy tonight.